For other uses, see Huanggang (disambiguation). 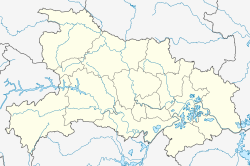 Huanggang is a prefecture-level city in easternmost Hubei Province, China. It is situated to the north of the middle reaches of the Yangtze River and is bounded in the north by the Dabie Mountains and is named after Mount Huanggang. It borders Henan in the north, Anhui in the east and Jiangxi in the south. The city's administrative area covers 17,453 square kilometres (6,739 sq mi) and the total population was 7.4031 million as of the 2017 census, 366,769 of whom resided in the urban area. The Ezhou – Huanggang built-up (or metro) area was home to 1,035,496 inhabitants comprising (Echeng district and Huangzhou district of Huanggang). In 2007, the city is named China's top ten livable cities by Chinese Cities Brand Value Report, which was released at 2007 Beijing Summit of China Cities Forum. Xugongmai Bronze Fu. Spring and Autumn period. Excavated at Weijia Pavilion Village, Yuwangcheng, Huangzhou. In 845 BC Marquis Wen 文侯 Huang Meng 黃孟 (aka Huang Zhang 黃璋) moved the capital of the State of Huang from Yicheng to Huangchuan (present-day Huangchuan, Henan). Huang Xi's descendants ruled State of Huang until 648 BC when it was destroyed by the State of Chu. The Marquis of Huang, Marquis Mu 穆侯 Huang Qisheng 黃企生, fled to the state of Qi. The people of Huang were forced to relocate to Chu. They settled in the region of present-day Hubei province, in a region known as the Jiangxia Prefecture 江夏郡 during the Han dynasty (206 BC-AD 220). There are many places in this region today that were named after Huang e.g. Huanggang, Huangpi, Huangmei, Huangshi, Huangan, Huangzhou etc. A large number of the people of Huang were also relocated to regions south of the Yangtze River. During the reign of Emperor Cheng of Jin, Later Zhao forces inflicted great damage on many Jin cities and bases north of the Yangtze and captured Zhucheng (邾城, in modern Huanggang, Hubei). Huanggang has a history of at least 2,000 years. Huanggang is home to several significant cultural sites of historical interest, such as the Buddhist Ancestral Hall of Sakyamuni at Doufang Mountain, Wuzu Temple and its Changchun Nunnery, and Dongpo Red Cliff. Huanggang is the home of Huanggang Middle School, one of the most prestigious secondary schools in China. The school is especially well known for its smart and diligent students. It has consistently excellent records in China's National Higher Education Entrance Examination and International Science Olympiad. Students from Huanggang Middle School have won 25 medals in The International Mathematical Olympiad, International Physics Olympiad and International Chemistry Olympiad. Textbooks and course materials edited by faculty from this school are widely recognized and popular across the country, making Huanggang High School a national brand. Huanggang Normal University is a full-time institution of higher education located in the city of Huanggang. Huanggang has a diversified economy, ranging from bio- and herbal medicine to manufacturing, agriculture, and tourism. Since ancient times, Huanggang has been renowned for local specialties such as the "Qichun Four Treasures" (snake, turtle, bamboo, and moxa), Huangmei "tiaohua" embroidery, and Wuxue "zhangshuiqian" bamboo products. Today, Huanggang at large is recognized for organic vegetables. With its "Guihuaxiang" brand of chestnuts, Luotian is the leading chestnut-growing county in all of China. Yingshan is famous for its "cloud mist" green tea. Qichun, of course, is famous for herbal medicine. Macheng is a national model county for cattle breeding. Huangmei is a major center of freshwater shrimp and fragrant jade rice production. And Hong'an peanut production ranks the first in Hubei Province. Huanggang enjoys an excellent transportation infrastructure. Wuhan airport is only 90 kilometres (56 mi) to the west, while Jiujiang Airport in Jiangxi to the east is only 160 kilometres (99 mi) away. Being on the Yangtze River, Wuhan main port is within 80 kilometres (50 mi) and Huangzhou District has a small bulk-handling port. There is an extensive road network, with three north-south and seven east-west major roads within the main city area. The city also is served by several new expressways, including the north-south "Jingzhu" (Beijing to Zhuhai, Guangdong) expressway and the east-west Wuhan to Shanghai expressway. Huanggang also is on the main north-south "Jingjiu" (Beijing to Hong Kong) and "Jingguang" (Beijing to Guangzhou, Guangdong) railway lines. Ehuang Bridge, between the main urban area of Huanggang and Ezhou; it carries the China National Highway 106. Edong Bridge carries the G45 Daqing–Guangzhou Expressway and the G50 Shanghai–Chongqing Expressway. Huanggang is served by the Beijing–Kowloon Railway, which has several stations within the prefecture-level city. The Huangzhou Station, located within Huangzhou District some 20 km (12 mi) northeast from downtown Huanggang, has the best service of all, with several trains a day to Beijing, Nanchang, and Shenzhen. Huanggang travelers can also use the Huangshi station on the Wuhan–Jiujiang Railway, across the river. Huang Kan, a Chinese philologist. As well, Huanggang is famous for producing military and political leaders. Hong'an County is known as the "County of Generals" in that more than 400 Chinese army generals have been born there, a total far greater than for any other county in all of China. In addition, former military leader and President of China, Li Xiannian (1909–1992), was born in Hong'an. ^ a b c d 辭海第六版 [Cihai (Sixth Edition)]. Shanghai: Shanghai Lexicographical Publishing House. September 2009. p. 957. ISBN 9787532628599. This page was last edited on 29 January 2019, at 11:44 (UTC).